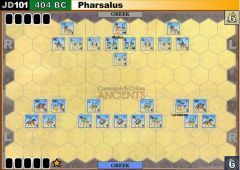 Thebes’ shocking victory at Leuctra in (371) had ended the Spartan hegemony over Greece. 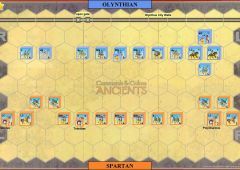 Epaminondas then organized the Arcadian League of cities in the Peloponnesus, in order to counter-balance Sparta and ensure Theban supremacy. 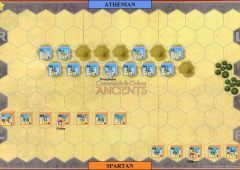 A division in the Arcadian league led Mantinea to ally with Sparta. 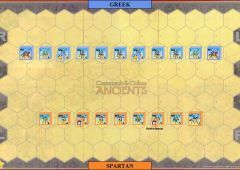 Sparta’s hereditary enemy, Athens, even joined in the alliance against Thebes. 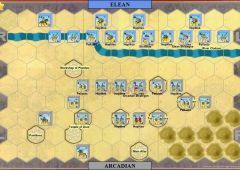 Epaminondas invaded in 362 to reassert Theban dominance. 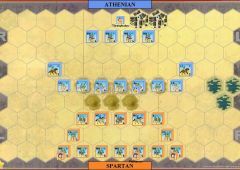 In a plain near Mantinea he encountered the enemy force of 20,000 foot and 2,000 horse with the Mantineans on the right, Spartans in the center, and Athenians on the left. 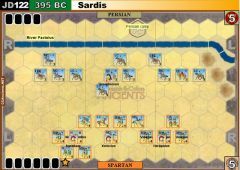 Epaminondas’ force of 30,000 foot and 3,000 horse was deployed with massive depth on his left, the same tactic he had used successfully at Leuctra. 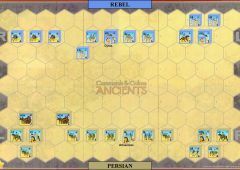 The Thebans closed in on the Mantinean wing and then grounded arms as if not to battle this day. 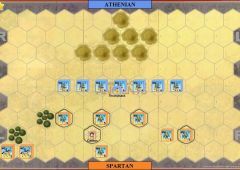 Once the Mantineans relaxed their guard, Epaminondas suddenly ordered the attack. 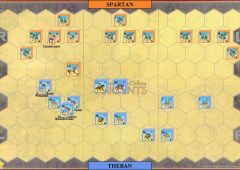 The onslaught broke the Mantinean right flank, leading to the defeat of the entire Spartan army. 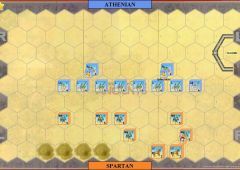 Disastrously for Thebes, Epaminondas was killed in the closing moments of the battle. 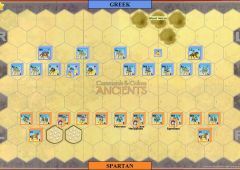 Sparta had been humbled again, but without her brilliant leader, Thebes was unable to maintain her hegemony over Greece. 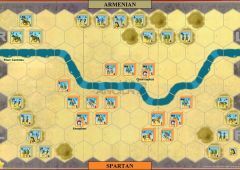 The ultimate result was a weakening of Greece that paved the way for the Macedonian conquest. 2 solitaire games with the Spartans winning both 6 -3, and 6 -0. While the first game was fairly even, the second was a complete rout. The Spartan right flank completely dominated. 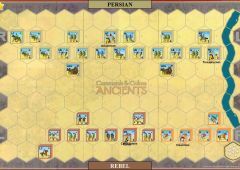 2 rolls taking out 2 complete Theban units certainly played a big part in the game. I much prefer the higher-quality image. Thank you so much! I cannot say whether it is worth the effort to upload other, higher-res images, since it's not my effort. I've just uploaded a bigger quality map picture. Sadly all pictures have to be exported manually (1 by 1) to higher quality and then bulk updated on website. If you guys think it's worth the pain... I'll plan this update for the months to come. When I do a browser Save Image As on the map, I get a 78KB file, which is low res. 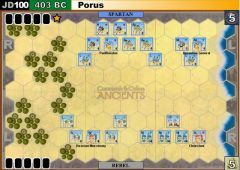 Is there a way to get a higher res version of the map and/or a unit type list? This was a lot of fun. It was very interesting how the middle game was just positioning and recovering from the little opening gambits. I don't think any of my games so far have had such a long period of positioning. Played this last night with Master Chief. 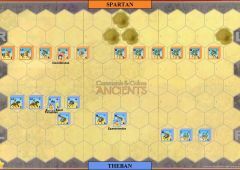 I was Theban and he was the Spartans. Here's an AAR on the game. 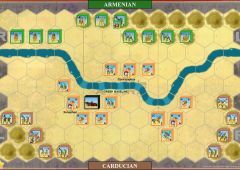 An interesting smaller scenario that produced an intriguing game. 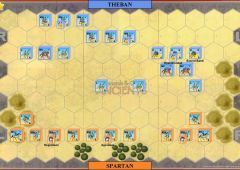 Theban started with "Mounted Charge" by the 3 medium cav that targeted the 2 Spartan Light infantry. Hoped to pick up 2 quick banners. 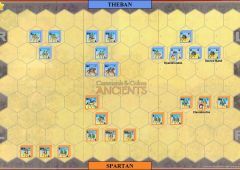 The result was 2 eliminated blocks for the Spartan infantry and a one block loss for the Theban horse. 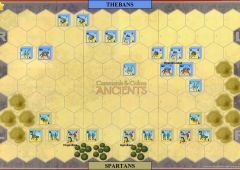 A quick counter, "Order 4 Units Left" by the Spartans had 1 Theban medium cav eliminated (0-1). 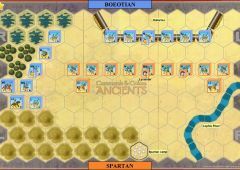 Second turn had the Thebans pressing their cav attack against the light inf which eliminated it and evened the score (1-1). Then a number of turns was spent by both sides pulling back forward units and manoeuvring their troops into lines for a big push. Each side made the odd Ranged attack or small CC that raised the score to 2-2. 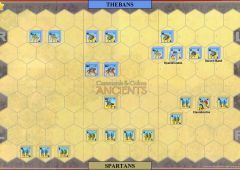 The Spartans pulled back their whole line and waited while the Thebans slowly edged forward. 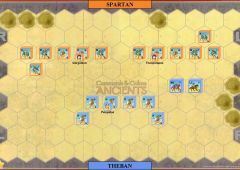 Then a 'Line Command' card advanced the whole Theban line that pitched it into CC with half of the Spartan line. 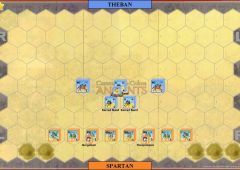 It cost the Spartan a light and a medium unit along with a leader (double helmets on the ldr casualty DR) and it was 5-2 to the Thebans. 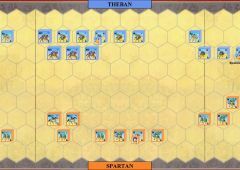 The Spartan then thought for a while to play 'Counterattack' and advanced what was left of their phalanx (2 heavies each with a leader and 2 mediums) at the Theban line. 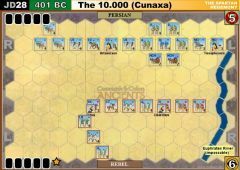 Took out the 3 Theban heavies to even the score (5-5). 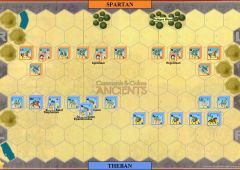 The Theban ldr managed to survive all this and it finally came down to an 'Order 2 units Left' card from the Theban to try and take out the last block from a Spartan heavy unit that survived the previous carnage. The Light infantry missed with their spears so the one remaining Theban Med cav charged and rolled a red square (and a sword) to take the game by the narrowest of margins (6-5). Cannot ask for better than that.